Left, Ed Breitschwerdt recipient of the 2017 AAVMC Excellence in Research Award. Right, Allen Cannedy, recipient of the 2017 Iverson Bell Award. 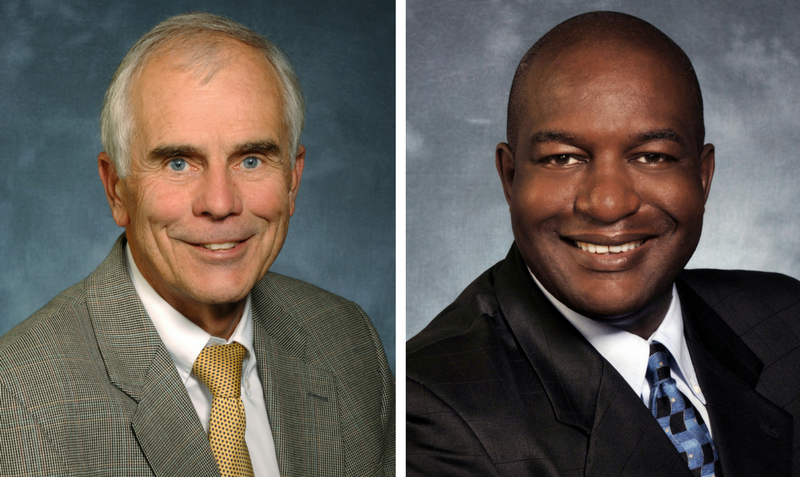 Two North Carolina State University College of Veterinary Medicine (CVM) professors will be honored for contributions to the field by the Association of American Veterinary Medical Colleges (AAVMC). The awards will be presented during the AAVMC’s 2017 Annual Conference and Iverson Bell Symposium March 10-12 in Washington. Breitschwerdt directs the Intracellular Pathogens Research Laboratory at NC State’s Comparative Medicine Institute and is also an adjunct professor of medicine at Duke University Medical Center. He is also the co-director the Vector Borne Diseases Diagnostic Laboratory. The Excellence in Research Award recognizes those who have “demonstrated excellence in original research, leadership in the scientific community and mentoring of trainees and colleagues,” according to the AAVMC. Cannedy oversees a wide range of innovative diversity programs and scholarships for the CVM, where he serves as a lecturer, recruiter and mentor dedicated to inclusivity on campus. He has secured nearly $1 million in diversity-related scholarships for CVM students. For more information on the AAVMC, go to aavmc.org.